ok, so i know it's Saturday... i meant to post this yesterday but got super busy. better late than never? i love intro! such a fun font for a little boy. i knew it was perfect for the second in line of my bestie's kids, Ethan. he is such a sweet little ball of energy. 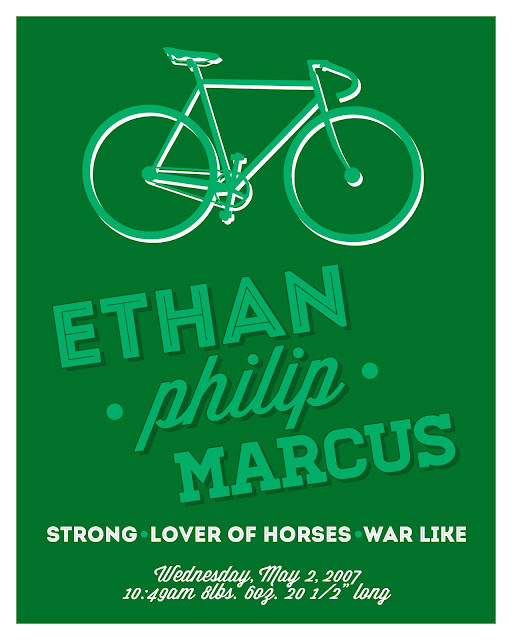 he loves to be active and riding bikes is one of his favorite things, so i made sure to include one in this design. he also loves the color green so i went with a vibrant kelly green color. hopefully he likes the poster! two down, two to go! Bekah, one of my best friends, has four kids and i'm working on a namesake poster for each one. such a fun project! what do you have going on today? i already did some crossfit and we're gonna take the kids to open gym to burn off some of their energy. it should be fun. i hope you have a good saturday!